If your home, garage or any out buildings suffer any damage caused by wind, rain, hail, snow or ice, Roth Construction is available to provide no obligation repair estimates and to get working on fixing the damages a quickly as possible. Roth Construction also repairs business buildings and structures as well as apartment buildings that are damaged by weather related incidents. Weather doesn’t care what time it is or what day it is… it just does what it wants, when it wants and there is no controlling it. That is why the weather damage repair experts at Roth Construction are here for you 24/7, ready to get your house or business protected from the elements. So whether it is a tree that has fallen onto your home, windows broken by wind or hail, shingles lifted off by high winds or any other type of weather damage, Roth Construction is on the ready to get things fixed. We will inspect the affected areas of your residence or business building to ensure that all of the damage is uncovered and documented. 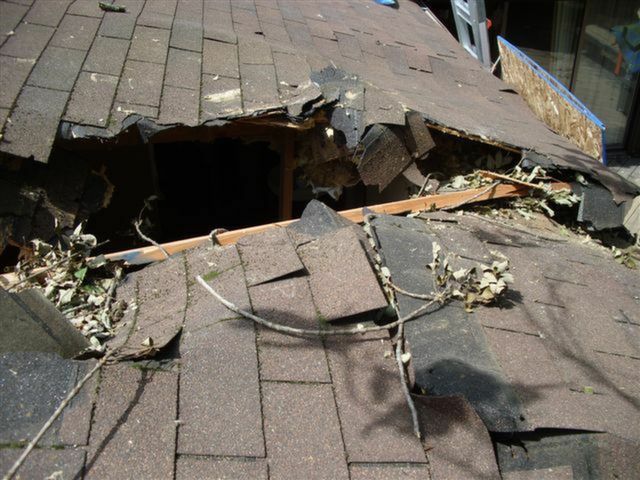 The Roth Columbus weather damage repair estimators will also seek to uncover any hidden, structural issues that may not be easy to see at first glance. All of the information will then be complied so that a proper repair estimate can be submitted to your insurance company. Roth Construction has long established relationships with all of the major insurance carriers in the greater Columbus area. We will work your insurance company directly to help ensure that the required work is estimated accurately and submitted properly so that we can get to work on your repairs as fast as possible. Roth Columbus is one of the most experienced weather damage restoration contractors in the Columbus, Ohio area. Our field crews will work tirelessly to get your repairs complete and your home protected from wind, rain, snow and/or ice quickly and efficiently. You can rest assured that all of the weather damage repair work performed by Roth Construction of Columbus is covered by our 1 Year Restoration Guarantee. Roth Construction guarantees all workmanship to be according to industry standards and will be free from defect. We will correct any workmanship issue according to the specifications of the original agreement. Roth Construction is ready and waiting for your call to help get your weather damaged property repaired so you can get your life back to normal. A live operator will take your call anytime day or night at (614) 777-4177.